I LOVE inspiring women and girls to live with intention and to give the world their gifts. This holiday season I hope you enjoy the goodies to refill your motivational cups! She leads…She teaches…She sells…She is…..YOU! In this audio recording, we discuss what success means to you. In my three-part system (Define, Design, Deliver) I always like to start with setting intentions and defining your intended outcomes. When you dive into any of my resources it’s important to fully understand what success is and what you’re working towards. This recording will equip you with a foundation for success. I use Selz to run my online store and I highly recommend them for their ease of use, beautiful layout, and integration with WordPress and Facebook for selling online. I use CoSchedule to manage my online marketing. It’s very helpful to get your message shared on various social media platforms without having to worry about this aspect of your business. A large part of productivity is focusing on what matters and delegating the rest. Don’t waste time on the things that don’t matter. LaShanda Henry (AKA SistaSense) has 20 years of money, marketing, and sales experience. She wants to help you startup, jumpstart or even fresh start your vision today. I trust her, I respect her and she KNOWS WHAT SHE’S TALKING ABOUT lol. Ignite your Fire within and WIN inside this year’s Back to Business virtual conference for women entrepreneurs. This year our agenda is all about how you can step into your greatness and start to “Collect with Confidence”. Black women are the fastest-growing entrepreneurs in the nation, starting businesses at six times the national average. But too many fail to sustain past the critical five-year mark. And too few black women-owned business are reaching $1 million in revenues. Truth be told, every day ambitious women find themselves stuck; desperately looking for someone to help them figure out where to start or what to do next in their business. Mentorship and startup support is crucial, which is why this year’s 7th annual Back to Business Virtual Conference focusses on tackling our big small business questions by providing clear starting points for entrepreneurial women in need of direction. 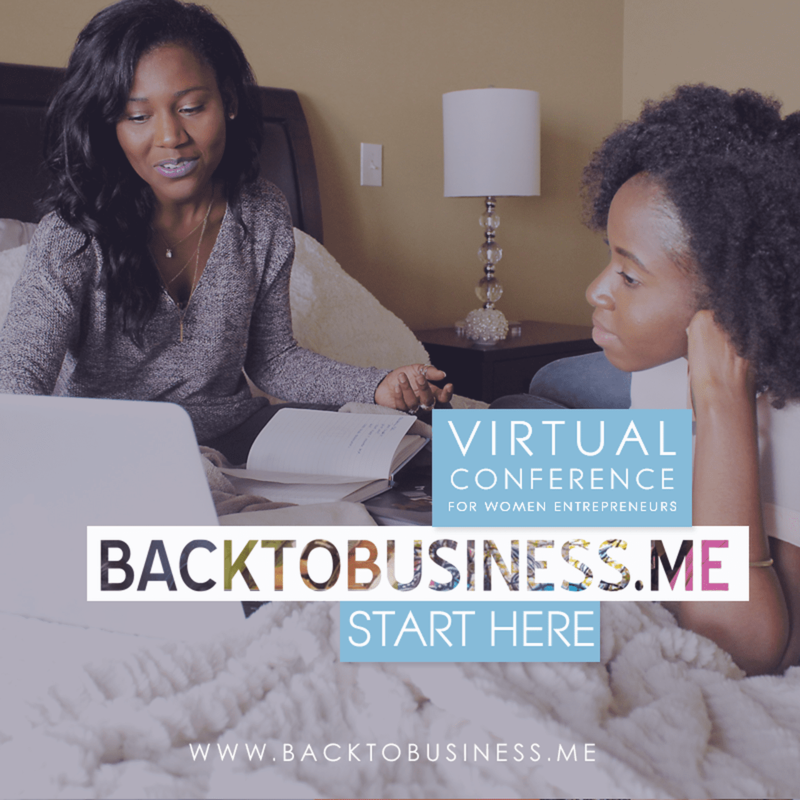 Back to Business is the ultimate virtual conference for serious sisters in need of real talk business training, mentorship and direction around Money, Marketing, and Sales from experienced, successful “Six and Seven Figure Sisters” who understand where you are coming from AND can provide you with the right steps to get to where you want to be. Our goal is to help you fast track your web business growth with clarity, connections, and confidence. We want to give you the right tools to move beyond all things that might be holding you back, so you can power through to your best you. From building your business to your best self, using technology to smart marketing solutions, we are going to explore essential aspects of starting and maintaining successful businesses online and across the globe.